Teresa wanted us to stay for the whole time we were in Santiago, all of 3 days, but we couldn't accept any more hospitality, despite her insistence. We got a taxi to the centre – Teresa wouldn't let us go without giving Claire the woolen shawl and giving us her details and promising to keep in touch. Our last place of lodging in South America was to be the Che Lagarto hostel Santiago, having had such a great time in its sister hostel in Rio de Janeiro. It was a lot quieter than we expected, with a pretty, leafy garden but the bar they were in the process would soon change the atmosphere. The manager and staff were incredibly welcoming and friendly. After catching up with the world we jumped on the clean, efficient metro to Santiago's central market. It's an impressive building designed by Gustave Eiffel and has his characteristic ornate iron work, reminiscent of his more famous Parisian tower. Its days of trade are mostly over, the majority of space having been converted into restaurants plying for the tourist trade. We ate upstairs, overlooking the whole place. 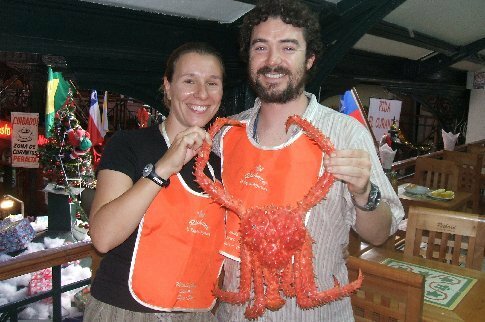 We had just finished ordering when a waiter came past us with a fabulous looking crab. We changed our minds and ordered one. It was an Antarctican King Crab and it was fabulous, washed down by a half bottle excellent Chilean Central Valley Sauvignon Blanc which wasn't enough so we ordered a full bottle which was too much. But we managed. Francesco, our Ecuadorian waiter who expertly split off the legs and seperated out the edible bits of the body for us (apparantely Antarctican King Crab is the only type opf King Crab whose body can be eaten) was good fun and offered to show us around the city the following evening. I suspected he was angling for a good tip but hey deserved it anyway. Admittedly a little tipsy we went for a wander around the centre of South America's self proclaimed most modern city. It certainly was clean and tidy but somehow lacked the edge of the other great cities we had visited. We came across the Plaza de Armas where the Santiago Chess club sat – lots of men (no women) sitting on the bandstand checkmating away. What a great way to spend an afternoon in the shade. Claire suggested I play, seeing one man bearded man smoking and waiting for a challenger. Why not? I was roundly beaten 5 times in less than an hour. I'd like to blame the wine, but I know that this fellow was simply better than me. I did make him think a little in the fifth game. I guessed that he played here every day so certainly got more practice in than I did with bi-annual games. The hostel had recommended a free theatrical art performance in another square in the evening so we made our way over. Throngs of well dressed people sat waiting on the well cared for grass and street sellers winded through the crowds selling popcorn (there is clearly a market for it but how they import it I don't know!) and sweets. The performance began and everyone stood up, obscuring the view. The snatches we did see were great – trapeze and theatrical dance along the lines of the cirque du soleil. And free! When we arrived at the hostel we realised that we had left a few things in Teresa's which we didn't really want to part with, plus we wanted to repay the favour so we walked down the Alameda, Santiago main street, towards the train station to visit her in her shop. She wasnt there but her son spotted us. He called her and we arranged to come down to meet her for lunch (and pick up our stuff) the next day. It felt a bit like wearing a disguise, looking pretty normal again. We wandered back up to the Plaza de Armas again. My chess adversary was there again. Disguised, I watched the game and it made me feel better to see he won categorically. Our last evening meal in Latin America was a chinese. In the morning we packed up again in the hostel and then went to meet Teresa, a bit pushed for time now we took the metro, She took us to a place ner the station where we had an amazing chicken and corn pie – a Chilean speciality and some Chilean salad which was just onion and tomato – nothing to write home about but they seemed equally proud of both dishes. We bade fond farewells to her, promising to stay in touch and took the metro back to Che Lagarto. One final bus journey to Santiago's modern, spacious airport. A few hours early, we joined a long snaking queue to check-in but were told we could only do so 3 hours before the flight – giving us some time to kill. We had a picada in the food court and played cacho and took advantage of the free wireless. Claire had her best game yet – I was doing terribly when I rolled five dice with twos, winning the game immediately. In the literally thousands of games we had played it had never happened before. Fitting that it was just as we left the continent. Once we checked in and passed security we headed to one of the lounges, access to which is a luxury I have kept from business life. As we were tucking in to the mini packets of biscuits and gin and bitter lemon a sports team walked in, all dressed in red tracksuits. Curious, I asked one of them which team they played for. The response was delivered tersely, as if I should have known “la seleccion nacion Chilena” - The Chilean national football team. I managed to get a photo of some of the more amenable ones with Travel Teddy (Claire's nieces gave her a little teddy to keep her company on the trip before she left) before they boarded their flight to Miami, where they were playing their next match against Honduras if I remember correctly. The Sydney via Auckland flight was called soon afterwards and we made our way to the gate, wondering what New Zealand would hold in store for us. Our time in South America had far exceeded expectations – could it possibly continue?